Hisham AbuBakr Metwally: On Saturday morning, former UN Secretary-General and Nobel Peace Prize laureate Kofi Annan passed away in Switzerland, at the age of 80 after a short illness, the family said. The African continent and the entire world have lost a man who has lived faithfully for justice and peace. Through his sincerity and courage, he was able to gain love and respect from the whole world. One of his boldest positions was his statement that the war on Iraq was illegal. This declaration angered then US President George W. Bush and his administration, but Annan insisted on clarifying the truth, undeterred by the consequences. "I am sorry for not being able to avoid the Iraq war, sad for the loss of friends in the bombing of the United Nations headquarters in Baghdad, and pride in opening the doors of the organization to representatives of civil society and the private sector," he said in a statement to summarize his 10 years in the UN. He was the best representative of the African continent and a high example for present and future generations. A statement from Ghana's President Nana Akufo-Addo expressed great sorrow, "The Government and people of Ghana, First Lady Rebecca and I are deeply saddened by the news of the death, in Berne, Switzerland, of one of our greatest compatriots, Kofi Annan." UN Secretary-General Antonio Guterres tweeted: "Kofi Annan was a guiding force for good. I join the world in mourning his loss. In these turbulent and trying times, his legacy as a global champion for peace will remain a true inspiration for us all." German Chancellor Angela Merkel expressed condolences over the death of Annan as "a prominent statesman in the service of the international community." Russia's Vladimir Putin expressed his deepest condolences through a message on the website of the Kremlin, "This remarkable man and great politician dedicated many years of his life to serving the United Nations". 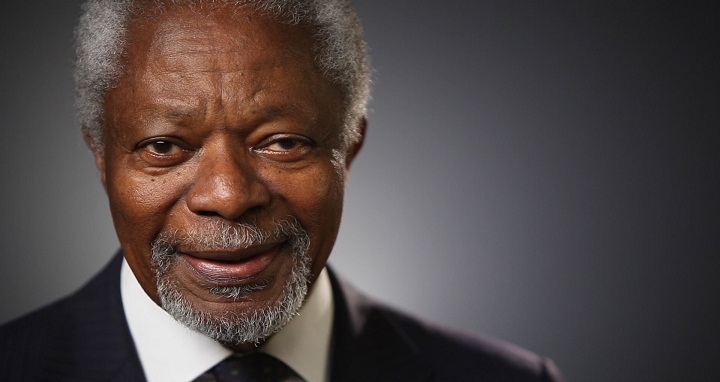 Annan was a world-class statesman who fought all of his life for a more just and peaceful world. Starting from a Ghanaian diplomat, he went on to become the seventh Secretary-General of the United Nations from 1997 to 2006. Immediately Annan presented a "reform plan for the United Nations" which was approved by the General Assembly in 1997. His plan intended to promote administrative and organizational processes, which aimed to support the organization's ability to respond quickly and effectively to its growing needs. These reforms have had a tangible impact on the functioning of the organization. They streamlined the work of the Secretariat and improved significantly the performance of various programs and decision-making bodies while improving the overall coordination of the organization's system, particularly with respect to security, peace, economic and social development, human rights and humanitarian assistance. In 2005, Annan played a key role in the establishment of two new intergovernmental bodies, the Peacebuilding Commission and the Human Rights Council. He also played a pivotal role in establishing global funds to fight AIDS, tuberculosis, and malaria. He strongly opposed the invasion of Iraq and Iran's nuclear program. After retiring from the United Nations in 2006, he returned to Ghana where he was involved with a number of African and international organizations. Kofi Ata Annan and his twin sister Efua Atta were born in 1938 In Kumasi, Ghana. His father Henry Reginald was the export manager of Lever Brothers Cocoa. Annan was lucky as both his grandparents and uncle were tribal leaders and provided him with an aristocratic life. In a religious school from 1954 to 1957, he learned about ethics, such as suffering everywhere mattered to people everywhere. Annan was inspired by witnessing the independence of his country in 1957: Ghana became the first British-African colony to gain independence. He joined the Kumasi Kumasi College of Science and Technology in 1958 to obtain a degree in economics. In 1961 with a grant from the Ford Foundation, he completed his undergraduate degree in economics at Macalester College in St. Paul. Minnesota. Then held postgraduate studies in economics at the International Institute for International Research (IIS) in Geneva, Switzerland, from 1961 to 1962. The Annan family said in a statement posted on Facebook, that his wife Nan and his children Ama, Kojo and Nina were beside him during his last days. Till the end of his days, Kofi Annan remained optimistic and determined to give. He was busy in supporting education, sustainable development and helping to save African lives. The last thing he did on August 9 was to plant a tree with his wife in South Africa and the last tweet was "You are never too young to lead." He also made a strong statement at the end of July, "Whether our task is fighting poverty, stemming the spread of disease or saving innocent lives from mass murder, we have seen that we cannot succeed without the leadership of the strong and the engagement of all." Hisham AbuBakr Metwally is the first economist researcher at the Central Department for Export and Import Policy under the Egyptian Ministry of Foreign Trade and Industry. The article reflects the author's opinion, and not necessarily the views of CGTN.